Pagans explores the rise of Christianity from a surprising and unique viewpoint: that of the people who witnessed their ways of life destroyed by what seemed then a powerful religious cult. These 'pagans' were actually pious Greeks, Romans, Syrians, and Gauls who observed the traditions of their ancestors. To these devout polytheists, Christians who worshiped only one deity were immoral atheists who believed that a splash of water on the deathbed could erase a lifetime of sin. 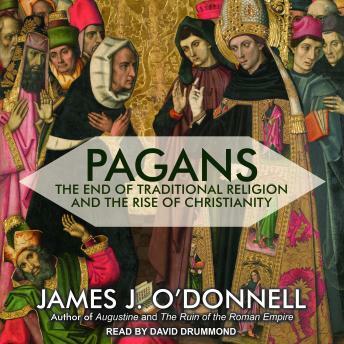 Religious scholar James J. O'Donnell takes us on a lively tour of the Ancient Roman world through the fourth century CE, when Romans of every nationality, social class, and religious preference found their world suddenly constrained by rulers who preferred a strange new god. Some joined this new cult, while others denied its power, erroneously believing it was little more than a passing fad. In Pagans, O'Donnell brings to life various pagan rites and essential features of Roman religion and life, offers fresh portraits of iconic historical figures, including Constantine, Julian, and Augustine, and explores important themes-Rome versus the east, civilization versus barbarism, plurality versus unity, rich versus poor, and tradition versus innovation-in this startling account.